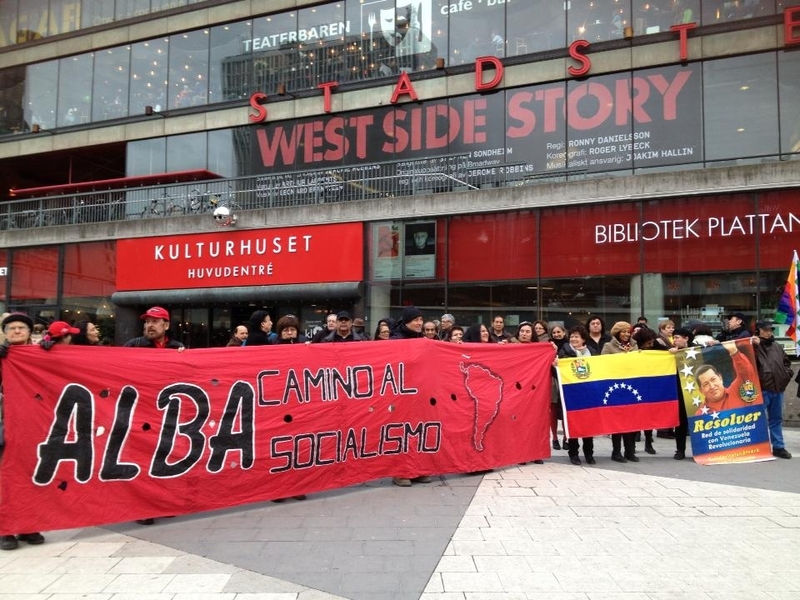 All around the world there were rallies, pickets and meetings against the attempted coup in Venezuela and in support of the revolution. Here are some accounts of those. Last Saturday in Central London a group of Venezuelan and Latin American activists decided to stand shoulder to shoulder in solidarity with Venezuelan Democracy, the group slowly started to gather around 12pm in front of the Venezuelan Embassy, by 2 o’clock when the opposition had arrived there was already a group of people chanting “We are democracy, Maduro President”. Surprisingly there were people in the opposition who wanted to know more about the organisers of the pro-democracy vigil. This type of conversations took place on the sides and some ended with a handshake. We were asked by a Venezuelan of the opposition why were we there defending something that was not of our concern. So, we answered that since the Bolivarian Revolution there is in Latin America a union that we had never seen before, organizations such as UNASUR and ALBA had made that union more palpable and real. We said that the democracy in Venezuela is our concern since an attack on a democratically elected president could open the door for coups d’états like we used to have in the continent. Also, something that caught our attention was a placard of the opposition that said: ‘Remember Falklands, Iraq, Libya… We deserve attention from Britain because Venezuela has oil too!! 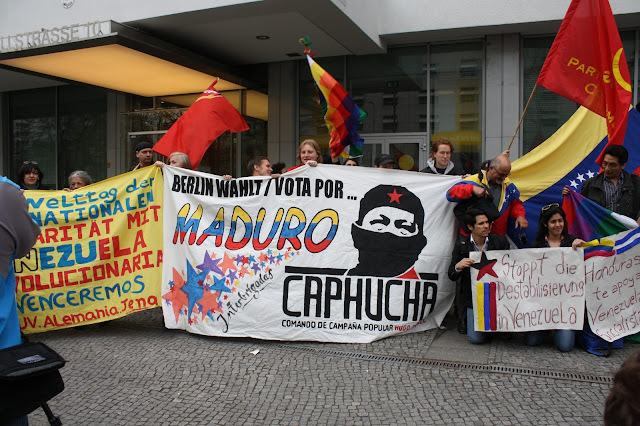 And more.’ This placard shows how desperate ‘Caprilistas’ are, inviting imperialists forces to occupy Venezuela. The day was a great success for the defenders of democracy as around 5pm the opposition dispersed fast, it almost looked like they had vanished. We found ourselves hugging, singing and dancing. It was clear that we had won, and that our message of peace and democracy was hard loud and clear. The Venezuelan embassy in London also covered both the opposition and the solidarity demos.